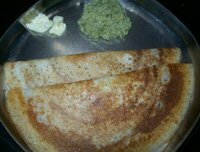 Dosa is refered to as dose, dosai, dosay, dwashi, dvashi etc in different states. In Malaysia and Singapore it is called thosai, tosai. Ghavan, amboli are dosa-variations from Maharashtra. Ghavan-ghatle is a traditional Naivedya(offering to god) made on the Gauri festival day in Maharashtra. Amboli is a multi-grain dosa so it is tasty as well as very good for health. Dose is a originally south Indian dish recipe that is popular not only all over India,but also in other countries. It is an important part of a south Indian breakfast recipe. Whenever I visit an Indian restaurant, I find people from different nationalities enjoying their dosa. You could call it Indian pancake recipe. The south indian variety is made from rice and urad dal (white lentil - black gram dal). It is rich in proteins and carbohydrades. As it does not use wheat, it is good for those with gluten free diet. Once the batter is ready, dose can be cooked very fast as it is thin. Traditionally it is served with coconut chutney, sambar, sagu and potato bhaji. But it can also be served with other wet or dry chutneys, vegetable stews, curries, pickles, and sauces. There are many variations of dosa-recipes such as plain-dosa, rava-dosa, Masala-Dosa , instant-dosa, onion-dosa, uttapam etc. It may be paper thin, called paper-dosa or dosa-roast. It may be the thick one called set-dosa which is served in sets of 3-4. It is served with a special sagu(vegetable stew). The size varies too in thickness as well as circumference. You can find dose from 2 inches to 2-3 feet wide. The other day I saw a restaurant where they offered 65 types of dosas. Must visit that place.